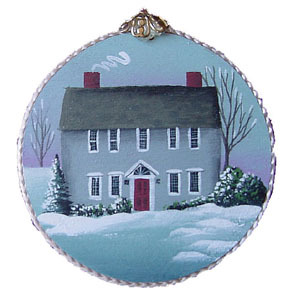 Own a one-of-a-kind portrait of any home with these made-to-order ornaments. Created from the finest quality hardwood, each one is hand-painted and finished with painstaking detail, capturing the unique character of your home. Since 1995 Earth Designs has painted hundreds of these custom ornaments for individual and professional customers alike. They have been used for mementos of the family home, house warmings, first home wedding presents, and by real estate professionals. Select from a wide range of sample backgrounds shown. Other options include a gift box and display easel as well as customized inscriptions of name and year on the back. Your satisfaction is unconditionally guaranteed.